If we are to gain an understanding of the incident recorded in the Bible that tells of Jesus being tempted by the devil in the wilderness, there are a few facts or truths we must first consider. The remarks made will not be traditional. This does not mean that I do not believe in the Bible or Jesus. I think the Bible is the greatest book we have and I certainly have a deep love, appreciation, and respect for Jesus Christ. However, I believe the time has come that we must begin to question some of the things that we have been taught about the Bible and about Jesus so that we can appreciate both more fully and gain greater insights into truth. 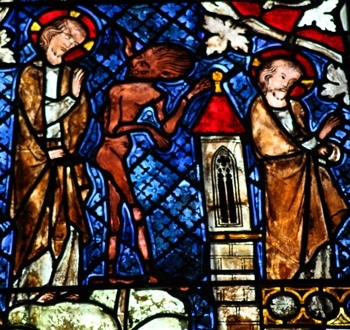 The story of the temptations is recorded in three of the four Gospels, namely Mark, Matthew, and Luke. Mark’s is the first record of the story and he is very brief in telling it. He simply states that after his baptism Jesus went into the wilderness and was tempted. He does not tell us what the temptations were. Matthew, the second Gospel to be written, tells basically the same version as Luke but he deliberately changes the order of the temptations. Whereas Matthew has the order of first, the stones into bread, second, Jesus on the pinnacle of the Temple, and third, Jesus being taken up into a mountain, Luke reverses the second and third. Not only does Luke reverse the last two, but he also leaves out portions of the story as it is recorded in Matthew. In Matthew when Jesus responds to the devil’s suggestion that he turn stones into bread, Matthew has Jesus quote Deut. 8:3 which states that man shall not live by bread alone but by every word out of the mouth of God. Luke leaves off the portion “by every word out of the mouth of God.” Also, in Matthew it states that Jesus was taken up to a high mountain. 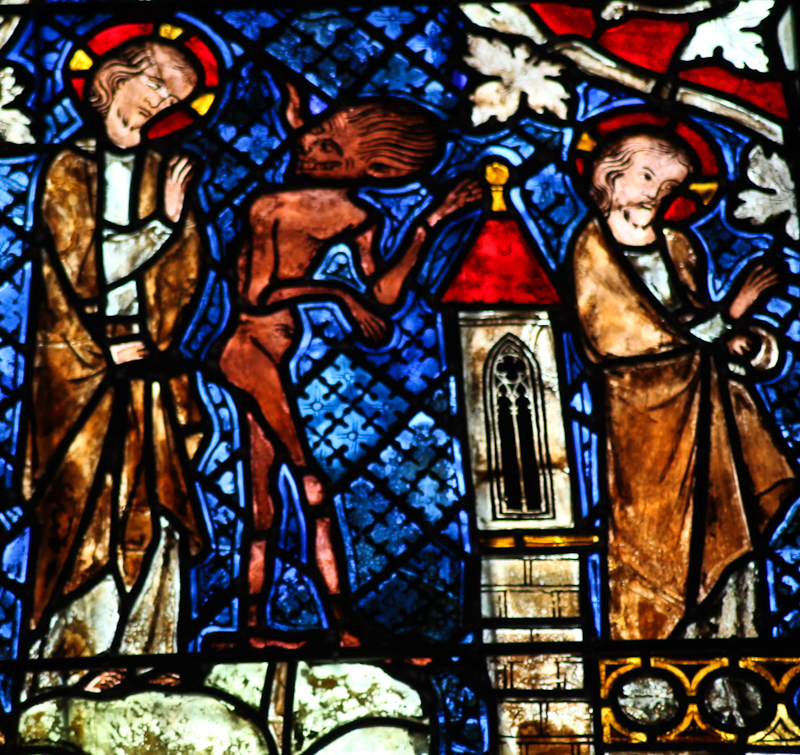 Luke simply states that “he (the devil) led him up.” It may be that Luke was more logical and had Jesus tempted in the wilderness before going to the Temple. Matthew has Jesus in the wilderness, then going to the Temple, and then going back out to the mountain which would no doubt be in the wilderness. An even greater challenge for some in understanding this story is the fact and truth that there is no real devil. A truth we often affirm in Unity states, “There is but One Presence, One Power in my life and the universe, God the good, omnipotent.” There was no devil tempting Jesus to violate principle. Many people, however, believe there is an evil power that fights God and tries to win converts to his side. But this is not true. This may upset and disturb some people’s theology, but they should remember they were taught this as they were growing up by well-meaning individuals, but misinformed individuals. What has been personified as a devil is simply a negative state of consciousness within the soul of man. The misuse of our divine power has been interpreted as an evil power but in truth it is simply a good power being misused. There is a negative collective human consciousness that exerts an influence on us and this has also been personified as a devil. But it is simply mass influence. An individual may sometimes do things when he is in a group that he would never do when he is alone. The idea that Jesus had to withstand the influence of doing something wrong is utterly preposterous. This is even more so when thought of in the old traditional way which teaches that Jesus was and is God. Why would Jesus be tempted when he already knew that the right application and expression of principle would always bring forth greater good than that offered by the mythical devil? When one has the conscious understanding of a Jesus Christ there is no temptation to violate principle for any reason. This story is given to help humans overcome their tendencies toward temptation. If Jesus changed water into wine for a party, what would be wrong in changing stones into bread if he needed food? Yet with his great understanding he would not even need food. You will recall the incident of the Samaritan woman at the well, that when the disciples returned and offered him food he said, “I have food to eat that you know not of.” An individual with the understanding that Jesus had would not be tempted to use his power in personal and selfish ways. He said “My kingdom is not of this world.” Why would he be tempted to use his power to establish or accept what the devil was offering? He certainly wasn’t interested in having a personal following. He always taught that we should go to the Father within and the Father within us would reward us openly. Jesus wasn’t an ordinary human being on the path to the kingdom. He was already in the kingdom. In truth he was never out of it like humanity on earth. He already knew his oneness with the Father, with God. He said, “I and my Father are one.” Some think of Jesus as gaining his power, ability, and understanding after many incarnations as a human on earth. But this is not true. Jesus was an individual who already had the consciousness of oneness with God, one who had never experienced the “Fall” as recorded in the story of the Garden of Eden. The story of the temptations is an allegorical story for humans who are seeking to follow the spiritual path. The story tells us that Jesus went into the wilderness and fasted forty days and nights. Fasting from food will not assure one of the experience of illumination. In fact, fasting may be more of a detriment for some. They may spend their time thinking about food or whatever else they have given up. For us humans at our level of consciousness, the hunger is not for food but for an awareness of truth. Jesus did not hunger for truth, for he already knew it. But those who are seeking to follow the spiritual path will experience this great hunger. This hunger may be also misinterpreted. When one experiences a degree of illumination it seems that the hunger for outer material things is intensified. The ego wants to use the spiritual power to satisfy human cravings. This is attempting to turn stones into bread, the attempt to find gratification in using spiritual power to satisfy human, personal desires. This is one of the biggest challenges the neophyte and quite often the long time truth student has to deal with. The individual wants to make truth work; he wants to make demonstrations. He wants to demonstrate prosperity and success or healing and prove that it works. He thinks some outer achievement will make him happy and successful. He doesn’t realize that all good is possible without all that personal force, manipulation, and coercion. The stones of personal concepts, personal desires, cannot be turned into nourishing and fulfilling experiences symbolized by the bread. What is it that satisfies? Matthew tells us “words out of the mouth of God.” Spiritual ideas, spiritual guidance. When we take time each day to seek God’s guidance and direction we will be shown what we should do for that day. Acceptance of spiritual ideas relieves us of the burden of selfishness, competitiveness, anxiety about our welfare and all the other negatives associated with them. The acceptance and expression of spiritual guidance makes us unselfish, generous, happy, free, and truly successful. The “word of God” is more valuable and nourishing and fulfilling than the stones of human concepts and personal desire. In the second temptation, following the story as recorded in Luke, Jesus is offered all the kingdoms of the world and the power and authority that went along with them. That would mean that Jesus would have power over the devil also. He already had that, for he had power over all negative human consciousness. The devil said the power had been given to him, but he does not say who gave it to him. He lied, for it wasn’t his to give. This is the nature of human consciousness. It seems to offer so much but can deliver so little. In Luke we are told that Jesus was “led up” but it does not say anything about a mountain. This is the nature of human expectations. It seems that we are being led up. It builds up our hopes and expectations by offering us power and control. It leads us to believe that we will conquer all that we desire to conquer through the use of personal power. People are conned over and over again every day with this type of philosophy, the big offers of something for little or nothing. Many study truth principles thinking it will give them power and control over their outer world. The purpose of studying truth is not to amass a personal fortune. The purpose is to learn how to serve more fully. As Jesus said, “The greatest among you shall be your servant.” When one serves he may become a millionaire and amass a personal fortune. When Jesus proclaimed that “all things are possible” and “ask what you will and it will be done” he meant that when we are in the high consciousness of oneness with God then we would have the power to speak the word and get results as He did. That is why Jesus also said, “The works that I do you shall do also.” The individual who is sincerely trying to follow Jesus into the kingdom will seek to serve. He will seek to help and support people and organizations that are trying to help those less fortunate to become more fortunate. He will especially seek to help spread the word of truth, the Gospel of “good news” that Jesus came to give to us. The third temptation tells us that Jesus was taken up to the pinnacle of the Temple and told to jump off. The devil quoted the 91st Psalm which states that God’s angels would keep him from being killed. That would be quite a feat and no doubt would have impressed those who saw it. Jesus answered, “Thou shalt not tempt the Lord thy God.” Sometimes a human being will tempt or try to tempt God. This may happen to the truth student as well. Some have the notion that if they will only take the big step in what they think is faith that God will come to their assistance. The individual may say, “I will buy a car on credit and see how God will take care of it.” There is nothing wrong with buying a car on credit. I am referring here to the individual who doesn’t have the consciousness to be responsible for the payments. He simply wants to test God to see if truth works. This is the individual who wants to see if God will come to his rescue if he will only be bold and take a chance. When one is following God’s guidance he will never have to take a chance, for he will be guided by God and there is no chance in that. Some think that they are proving their faith by taking bold leaps. The bold leap is not one of faith but one of uncertainty and blind hope. When one has faith he has an inner knowing that something is right. It may be challenging but he has the faith that God is leading him and he goes forward with spiritual confidence. When we follow inner guidance we do not have to force things to work out right. If something is not right for us we can never make it right no matter how bold we get or how much we try to increase our desire for it. We are told that as a result of meeting the temptations successfully that the angels came and ministered to Jesus. When we are truly receptive there is a continuous flow of inspiration as we need it. This does not mean that you will know everything at once, but what you need to know at the moment will be given you and it will be inspiring, uplifting, and encouraging. This will prepare you to continue your journey toward the full realization of the inner kingdom.